The Shroud of Turin is the traditional burial cloth of Jesus Christ. It has been housed in the Cathedral of St. John the Baptist in Turin, Italy since 1578. The enigmatic fine linen cloth bears a "negative" image of a crucified man with wounds consistent with the Gospel accounts of the Crucifixion of Jesus. Although various hypotheses abound, a valid scientific explanation of the unique image is still unknown. Is it authentic? The Shroud...the traditional burial cloth of Jesus Christ. It is an artifact for the entire world. 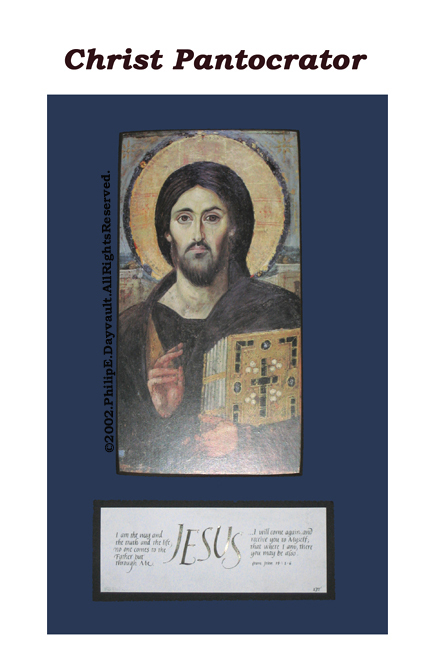 Many feel the Image was perhaps imprinted on the cloth at the moment of Resurrection. Although numerous hypotheses abound, the Image formation process is still unknown. The Shroud has been under the authority and in the custody of Catholic Church for centuries—however, its full legal ownership title was bequeathed to the Holy See (Vatican), specifically to the living Pope, and to remain in Turin, only in 1983. History, science and religion strongly support its authenticity. “The most important Relic in the history of Christendom” —Pope Paul VI. The Shroud was purportedly taken from Jerusalem circa AD30 to Edessa, Turkey. From circa AD57 to AD525, it was allegedly secreted in a surrounding wall—and discovered during flood repairs in AD525. 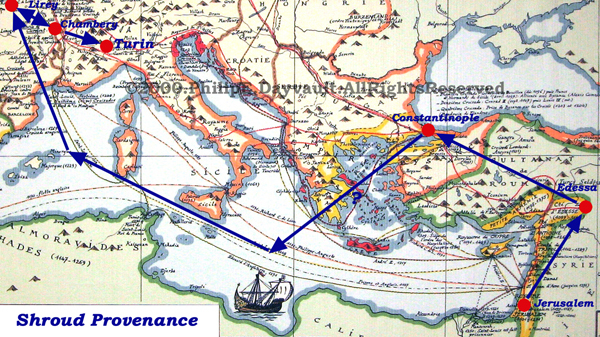 The Shroud was taken to Constantinople in AD944—and remained there until 1204. It was then taken by the Knights Templar of the 4th Crusade and hidden for approximately 150 years—“mystery years.” Confirmed by Vatican documents in April 2009. 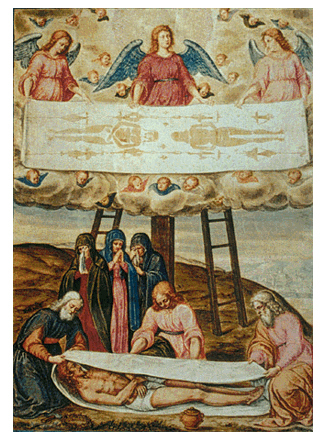 The Shroud re-surfaced in Lirey, France in about 1353 and toggled between Chambéry until 1578—when taken to Turin, Italy. It has been housed in the Cathedral of St. John the Baptist in Turin since 1578. The Shroud measures approximately 14’3” long by 3’7” wide. It is fine linen, woven in 3x1 herringbone pattern. It bears the image of a crucified man, with wounds consistent with the Scriptural depiction of the Crucifixion of Jesus Christ. The original cloth inexplicably bears the characteristics of a photographic "negative." The image also bears the characteristics of some type of radiological influence. Image formation mechanism is still unknown; yet radiation, coronal discharge and/or chemical reactions are the most favored probabilities in the formation of the image. The image is spatially encoded, making it a unique “3-dimensional”-like image. The image is superficial only. The blood does not penetrate the image, while it does penetrate the cloth. Thus, the blood layers preceded the Shroud image. All tested wound areas bear human blood. Some of the human blood has been typed AB ("universal receptor"). Many pollen grains from the Shroud are consistent with flowers and plants from the general environs of Jerusalem. In 1978, the most definitive testing of the Shroud was conducted over the period of one week, around the clock. The Shroud of Turin Research Project, STURP, consisted of approximately 40 American scientists. Its work remains the standard to date. 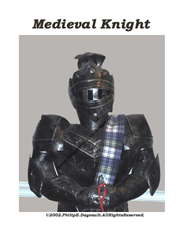 The RadioCarbon Dating, C-14, test in 1988 indicated a 1260-1390 origin of the cloth. However, in early 2005, two renowned scientists, the late Dr. Ray Rogers and Dr.John Brown, disproved these dates, providing evidence that the test was conducted not on the Shroud, but on a possible rewoven site. Thus, the Shroud could be much older than originally thought, and could, indeed, come from the actual time of Jesus Christ.